With all of the cooking I have done recently you would think most of it was just for big holiday dinners where things would be fancy with lots of courses. While it is true that that involved a lot of the recipes that I tried, I also wanted to make some things just to have at home for the 3 of us for a weeknight meal. We all really like to have turkey around here but finding a turkey that is a reasonable size for just the 3 of us is never an easy thing. Luckily this time of year you can usually get a turkey breast that is a decent size so that you can get a good meal out of it and have some leftovers to do some other things like turkey pot pie, turkey sandwiches, turkey soup or a wide variety of other things. When I made the roasted turkey breast, I used a recipe from Williams-Sonoma. It is a pretty basic recipe and a lot easier than roasting an entire turkey. This recipe takes about 2 hours so you are able to get it done during the week if you wanted to have something different for a weeknight dinner. Position a rack in the lower 3rd of the oven and preheat the oven to 450°. Place the 2 onion halves next to each other in the center of a roasting pan. Line up the carrots, celery and parsnip on either side of the onions. Place the garlic cloves in among the other vegetables. Pat the turkey breast dry with paper towels. Working your hand carefully under the skin of the turkey to avoid tearing it, separate the skin from the meat on both sides of the turkey breast, but do not detach it. Pat the meat dry with a paper towel. Rub the butter over the turkey meat under the skin on each side of the breast. Season the turkey breast with salt and pepper. Pull the skin down to cover the meat. If necessary, stick toothpicks through the skin and the ribs to secure the skin. Set the turkey breast, skin side down, on top of the vegetables. Pour in 3 cups of the chicken broth. Roast the turkey breast for 30 minutes. Reduce the oven temperature to 325°. Turn the breast to rest on one side and baste with the liquid in the pan. Roast the turkey breast for another 30 minutes. Turn the turkey breast to rest on the opposite side and baste it again with the pan liquid. Roast the breast for another 30 minutes. Turn the breast skin side up and baste it again with the pan liquid. If the liquid has begun to evaporate, add the remaining 1 cup of the chicken broth to the pan. Roast the turkey breast for another 30 minutes, baste and then continue roasting until an instant-read thermometer inserted into the thickest part away from the bone registers 165°, about 2 to 2 1/2 hours total cooking time at approximately 20 minutes per pound. If the top of the turkey breast begins to over brown, tent it loosely with aluminum foil. Remove the turkey breast from the oven and transfer it to a cutting board. Allow the turkey breast to rest for 20 minutes. The internal temperature of the meat will rise to 170° during the 1st 10 minutes of resting, and the juices will settle. Carve the turkey breast into slices and serve immediately. While this particular recipe does involve a little bit of work since you have to turn in baste the turkey every 30 minutes, it is certainly worth the results. 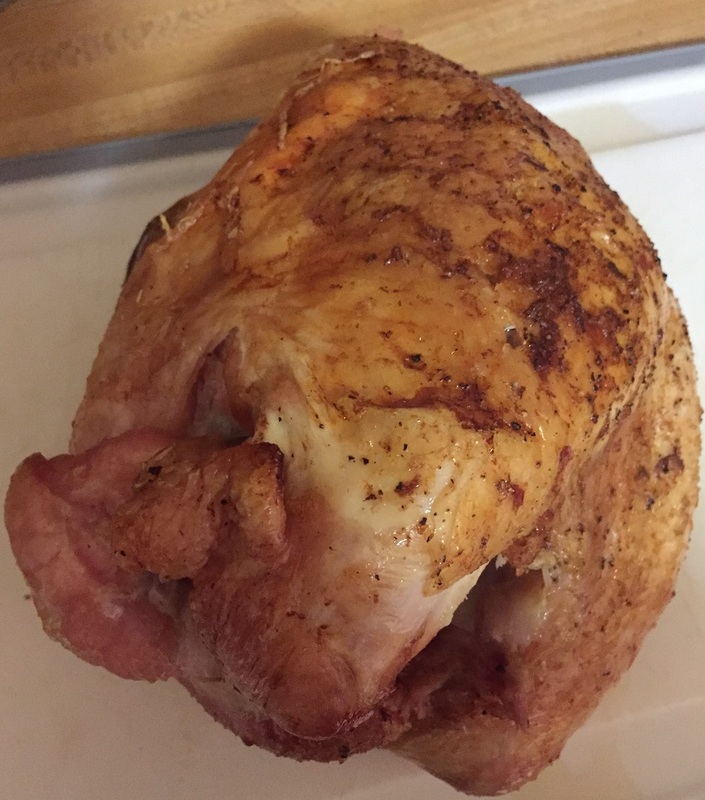 You get a really nice crisp skin on the turkey and the turkey meat itself is very moist and tender. The drippings that were left in the pan make an excellent gravy as well. Of course, with just the 3 of us a 6 pound turkey breast meant there were plenty of leftovers so there will definitely be some turkey sandwiches in our future. That’s all I have for today. Check back next time for another recipe. Until then, enjoy the rest of your day, and enjoy your meal!